Swine influenza is an infection caused by any one of several types of swine influenza viruses. Swine influenza virus (SIV) or swine-origin influenza virus (S-OIV) is any strain of the influenza family of viruses that is endemic in pigs. As of 2009, the known SIV strains include influenza C and the subtypes of influenza A known as H1N1, H1N2, H2N1, H3N1, H3N2, and H2N3. The Swine flu was initially seen in humans in Mexico in 2009, where the strain of the particular virus was a mixture from 3 types of strains. Six of the genes are very similar to the H1N2 influenza virus that was found in pigs around 2000. Around the mid-20th century, identification of influenza subtypes became possible, allowing accurate diagnosis of transmission to humans. Since then, only 50 such transmissions have been confirmed. These strains of swine flu rarely pass from human to human. 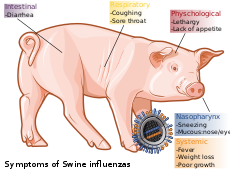 Symptoms of zoonotic swine flu in humans are similar to those of influenza and of influenza-like illness in general, namely chills, fever, sore throat, muscle pains, severe headache, coughing, weakness, shortness of breath, and general discomfort. Cases of swine flu have been reported in India, with over 31,156 positive test cases and 1,841 deaths up to March 2015. In swine flu, an influenza infection produces fever, lethargy, sneezing, coughing, difficulty breathing and decreased appetite. In some cases the infection can cause miscarriage. Although mortality is usually low (around 1–4%), the virus can produce weight loss and poor growth, causing economic loss to farmers. Infected pigs can lose up to 12 pounds of body weight over a three- to four-week period. Swine have receptors to which both avian and mammalian influenza viruses are able to bind to, which leads to the virus being able to evolve and mutate into different forms. Influenza A is responsible for infecting swine, and was first identified in the summer of 1918. Pigs have often been seen as "mixing vessels", which help to change and evolve strains of disease that are then passed on to other mammals, such as humans. Direct transmission of a swine flu virus from pigs to humans is occasionally possible (zoonotic swine flu). In all, 50 cases are known to have occurred since the first report in medical literature in 1958, which have resulted in a total of six deaths. Of these six people, one was pregnant, one had leukemia, one had Hodgkin's lymphoma and two were known to be previously healthy. One of these had unknown whereabouts. Despite these apparently low numbers of infections, the true rate of infection may be higher, since most cases only cause a very mild disease, and will probably never be reported or diagnosed. In this video, Dr. Joe Bresee, with CDC's Influenza Division, describes the symptoms of swine flu and warning signs to look for that indicate the need for urgent medical attention. According to the Centers for Disease Control and Prevention (CDC), in humans the symptoms of the 2009 "swine flu" H1N1 virus are similar to those of influenza and of influenza-like illness in general. Symptoms include fever; cough, sore throat, watery eyes, body aches, shortness of breath, headache, weight loss, chills, sneezing, runny nose, coughing, dizziness, abdominal pain, lack of appetite and fatigue. The 2009 outbreak has shown an increased percentage of patients reporting diarrhea and vomiting as well. The 2009 H1N1 virus is not zoonotic swine flu, as it is not transmitted from pigs to humans, but from person to person through airborne droplets. Because these symptoms are not specific to swine flu, a differential diagnosis of probable swine flu requires not only symptoms, but also a high likelihood of swine flu due to the person's recent and past medical history. For example, during the 2009 swine flu outbreak in the United States, the CDC advised physicians to "consider swine influenza infection in the differential diagnosis of patients with acute febrile respiratory illness who have either been in contact with persons with confirmed swine flu, or who were in one of the five U.S. states that have reported swine flu cases or in Mexico during the seven days preceding their illness onset." A diagnosis of confirmed swine flu requires laboratory testing of a respiratory sample (a simple nose and throat swab). The most common cause of death is respiratory failure. Other causes of death are pneumonia (leading to sepsis), high fever (leading to neurological problems), dehydration (from excessive vomiting and diarrhea), electrolyte imbalance and kidney failure. Fatalities are more likely in young children and the elderly. Influenza is quite common in pigs, with about half of breeding pigs having been exposed to the virus in the US. Antibodies to the virus are also common in pigs in other countries. The main route of transmission is through direct contact between infected and uninfected animals. These close contacts are particularly common during animal transport. Intensive farming may also increase the risk of transmission, as the pigs are raised in very close proximity to each other. The direct transfer of the virus probably occurs either by pigs touching noses, or through dried mucus. Airborne transmission through the aerosols produced by pigs coughing or sneezing are also an important means of infection. The virus usually spreads quickly through a herd, infecting all the pigs within just a few days. Transmission may also occur through wild animals, such as wild boar, which can spread the disease between farms. Pigs are unusual as they can be infected with influenza strains that usually infect three different species: pigs, birds and humans. This makes pigs a host where influenza viruses might exchange genes, producing new and dangerous strains. Avian influenza virus H3N2 is endemic in pigs in China, and has been detected in pigs in Vietnam, increasing fears of the emergence of new variant strains. H3N2 evolved from H2N2 by antigenic shift. In August 2004, researchers in China found H5N1 in pigs. These H5N1 infections may be quite common; in a survey of 10 apparently healthy pigs housed near poultry farms in West Java, where avian flu had broken out, five of the pig samples contained the H5N1 virus. The Indonesian government has since found similar results in the same region. Additional tests of 150 pigs outside the area were negative. The influenza virion is roughly spherical. It is an enveloped virus; the outer layer is a lipid membrane which is taken from the host cell in which the virus multiplies. Inserted into the lipid membrane are "spikes", which are proteins—actually glycoproteins, because they consist of protein linked to sugars—known as HA (hemagglutinin) and NA (neuraminidase). These are the proteins that determine the subtype of influenza virus (A/H1N1, for example). The HA and NA are important in the immune response against the virus; antibodies (proteins made to combat infection) against these spikes may protect against infection. The NA protein is the target of the antiviral drugs Relenza and Tamiflu. Also embedded in the lipid membrane is the M2 protein, which is the target of the antiviral adamantanes amantadine and rimantadine. Of the three genera of influenza viruses that cause human flu, two also cause influenza in pigs, with influenza A being common in pigs and influenza C being rare. Influenza B has not been reported in pigs. Within influenza A and influenza C, the strains found in pigs and humans are largely distinct, although because of reassortment there have been transfers of genes among strains crossing swine, avian, and human species boundaries. Influenza viruses infect both humans and pigs, but do not infect birds. Transmission between pigs and humans have occurred in the past. For example, influenza C caused small outbreaks of a mild form of influenza amongst children in Japan and California. Because of its limited host range and the lack of genetic diversity in influenza C, this form of influenza does not cause pandemics in humans. Swine influenza is caused by influenza A subtypes H1N1, H1N2, H2N3, H3N1, and H3N2. In pigs, four influenza A virus subtypes (H1N1, H1N2, H3N2 and H7N9) are the most common strains worldwide. In the United States, the H1N1 subtype was exclusively prevalent among swine populations before 1998; however, since late August 1998, H3N2 subtypes have been isolated from pigs. As of 2004, H3N2 virus isolates in US swine and turkey stocks were triple reassortants, containing genes from human (HA, NA, and PB1), swine (NS, NP, and M), and avian (PB2 and PA) lineages. In August 2012, the Center for Disease Control and Prevention confirmed 145 human cases (113 in Indiana, 30 in Ohio, one in Hawaii and one in Illinois) of H3N2v since July 2012. The death of a 61-year-old Madison County, Ohio woman is the first in the nation associated with a new swine flu strain. She contracted the illness after having contact with hogs at the Ross County Fair. The CDC recommends real-time PCR as the method of choice for diagnosing H1N1. The oral or nasal fluid collection and RNA virus preserving filter paper card is commercially available. This method allows a specific diagnosis of novel influenza (H1N1) as opposed to seasonal influenza. Near-patient point-of-care tests are in development. Prevention of swine influenza has three components: prevention in pigs, prevention of transmission to humans, and prevention of its spread among humans. You can prevent it from spreading by washing your hands often, for about as long as you can sing the happy birthday song twice, avoid touching your eyes, nose or mouth. Stay away from someone who has symptoms of the cold or flu and also avoid contact with others. Methods of preventing the spread of influenza among swine include facility management, herd management, and vaccination (ATCvet code: QI09AA03 (WHO)). Because much of the illness and death associated with swine flu involves secondary infection by other pathogens, control strategies that rely on vaccination may be insufficient. Control of swine influenza by vaccination has become more difficult in recent decades, as the evolution of the virus has resulted in inconsistent responses to traditional vaccines. Standard commercial swine flu vaccines are effective in controlling the infection when the virus strains match enough to have significant cross-protection, and custom (autogenous) vaccines made from the specific viruses isolated are created and used in the more difficult cases. Present vaccination strategies for SIV control and prevention in swine farms typically include the use of one of several bivalent SIV vaccines commercially available in the United States. Of the 97 recent H3N2 isolates examined, only 41 isolates had strong serologic cross-reactions with antiserum to three commercial SIV vaccines. Since the protective ability of influenza vaccines depends primarily on the closeness of the match between the vaccine virus and the epidemic virus, the presence of nonreactive H3N2 SIV variants suggests current commercial vaccines might not effectively protect pigs from infection with a majority of H3N2 viruses. The United States Department of Agriculture researchers say while pig vaccination keeps pigs from getting sick, it does not block infection or shedding of the virus. Facility management includes using disinfectants and ambient temperature to control viruses in the environment. They are unlikely to survive outside living cells for more than two weeks, except in cold (but above freezing) conditions, and are readily inactivated by disinfectants. Herd management includes not adding pigs carrying influenza to herds that have not been exposed to the virus. The virus survives in healthy carrier pigs for up to three months, and can be recovered from them between outbreaks. Carrier pigs are usually responsible for the introduction of SIV into previously uninfected herds and countries, so new animals should be quarantined. After an outbreak, as immunity in exposed pigs wanes, new outbreaks of the same strain can occur. Swine can be infected by both avian and human flu strains of influenza, and therefore are hosts where the antigenic shifts can occur that create new influenza strains. The transmission from swine to humans is believed to occur mainly in swine farms, where farmers are in close contact with live pigs. Although strains of swine influenza are usually not able to infect humans, this may occasionally happen, so farmers and veterinarians are encouraged to use face masks when dealing with infected animals. The use of vaccines on swine to prevent their infection is a major method of limiting swine-to-human transmission. Risk factors that may contribute to swine-to-human transmission include smoking and, especially, not wearing gloves when working with sick animals, thereby increasing the likelihood of subsequent hand-to-eye, hand-to-nose or hand-to-mouth transmission. Influenza spreads between humans when infected people cough or sneeze, then other people breathe in the virus or touch something with the virus on it and then touch their own face. "Avoid touching your eyes, nose or mouth. Germs spread this way." Swine flu cannot be spread by pork products, since the virus is not transmitted through food. The swine flu in humans is most contagious during the first five days of the illness, although some people, most commonly children, can remain contagious for up to ten days. Diagnosis can be made by sending a specimen, collected during the first five days, for analysis. 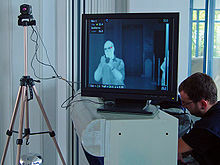 Thermal imaging camera and screen, photographed in an airport terminal in Greece – thermal imaging can detect elevated body temperature, one of the signs of the virus H1N1 (swine influenza). Recommendations to prevent spread of the virus among humans include using standard infection control, which includes frequent washing of hands with soap and water or with alcohol-based hand sanitizers, especially after being out in public. Chance of transmission is also reduced by disinfecting household surfaces, which can be done effectively with a diluted chlorine bleach solution. Experts agree hand-washing can help prevent viral infections, including ordinary and the swine flu infections. Also, avoiding touching one's eyes, nose or mouth with one's hands helps to prevent the flu. Influenza can spread in coughs or sneezes, but an increasing body of evidence shows small droplets containing the virus can linger on tabletops, telephones and other surfaces and be transferred via the fingers to the eyes, nose or mouth. Alcohol-based gel or foam hand sanitizers work well to destroy viruses and bacteria. Anyone with flu-like symptoms, such as a sudden fever, cough or muscle aches, should stay away from work or public transportation, and should contact a doctor for advice. Social distancing, another tactic, is staying away from other people who might be infected, and can include avoiding large gatherings, spreading out a little at work, or perhaps staying home and lying low if an infection is spreading in a community. Public health and other responsible authorities have action plans which may request or require social distancing actions, depending on the severity of the outbreak. Vaccines are available for different kinds of swine flu. The U.S. Food and Drug Administration (FDA) approved the new swine flu vaccine for use in the United States on September 15, 2009. Studies by the National Institutes of Health show a single dose creates enough antibodies to protect against the virus within about 10 days. In the aftermath of the 2009 pandemic, several studies were conducted to see who received influenza vaccines. These studies show that whites are much more likely to be vaccinated for seasonal influenza and for the H1N1 strain than African Americans  This could be due to several factors. Historically, there has been mistrust of vaccines and of the medical community from African Americans. Many African Americans do not believe vaccines or doctors to be effective. This mistrust stems from the exploitation of the African American communities during studies like the Tuskegee study. Additionally, vaccines are typically administered in clinics, hospitals, or doctor’s offices. Many people of lower socioeconomic status are less likely to receive vaccinations because they do not have health insurance. Although there is no formal national surveillance system in the United States to determine what viruses are circulating in pigs, an informal surveillance network in the United States is part of a world surveillance network. As swine influenza is rarely fatal to pigs, little treatment beyond rest and supportive care is required. Instead, veterinary efforts are focused on preventing the spread of the virus throughout the farm, or to other farms. Vaccination and animal management techniques are most important in these efforts. Antibiotics are also used to treat this disease, which although they have no effect against the influenza virus, do help prevent bacterial pneumonia and other secondary infections in influenza-weakened herds. In Europe the avian-like H1N1 and the human-like H3N2 and H1N2 are the most common influenza subtypes in swine, of which avian-like H1N1 is the most frequent. Since 2009 another subtype, pdmH1N1(2009), emerged globally and also in European pig population. The prevalence varies from country to country but all of the subtypes are continuously circulating in swine herds. In the EU region whole-virus vaccines are available which are inactivated and adjuvanted. Vaccination of sows is common practice and reveals also a benefit to young pigs by prolonging the maternally level of antibodies. Several commercial vaccines are available including a trivalent one being used in sow vaccination and a vaccine against pdmH1N1(2009). In vaccinated sows multiplication of viruses and virus shedding are significantly reduced. If a person becomes sick with swine flu, antiviral drugs can make the illness milder and make the patient feel better faster. They may also prevent serious flu complications. For treatment, antiviral drugs work best if started soon after getting sick (within two days of symptoms). Beside antivirals, supportive care at home or in a hospital focuses on controlling fevers, relieving pain and maintaining fluid balance, as well as identifying and treating any secondary infections or other medical problems. The U.S. Centers for Disease Control and Prevention recommends the use of oseltamivir (Tamiflu) or zanamivir (Relenza) for the treatment and/or prevention of infection with swine influenza viruses; however, the majority of people infected with the virus make a full recovery without requiring medical attention or antiviral drugs. The virus isolated in the 2009 outbreak have been found resistant to amantadine and rimantadine. In the U.S., on April 27, 2009, the FDA issued Emergency Use Authorizations to make available Relenza and Tamiflu antiviral drugs to treat the swine influenza virus in cases for which they are currently unapproved. The agency issued these EUAs to allow treatment of patients younger than the current approval allows and to allow the widespread distribution of the drugs, including by volunteers. Swine influenza was first proposed to be a disease related to human flu during the 1918 flu pandemic, when pigs became ill at the same time as humans. The first identification of an influenza virus as a cause of disease in pigs occurred about ten years later, in 1930. For the following 60 years, swine influenza strains were almost exclusively H1N1. Then, between 1997 and 2002, new strains of three different subtypes and five different genotypes emerged as causes of influenza among pigs in North America. In 1997–1998, H3N2 strains emerged. These strains, which include genes derived by reassortment from human, swine and avian viruses, have become a major cause of swine influenza in North America. Reassortment between H1N1 and H3N2 produced H1N2. In 1999 in Canada, a strain of H4N6 crossed the species barrier from birds to pigs, but was contained on a single farm. Swine flu has been reported numerous times as a zoonosis in humans, usually with limited distribution, rarely with a widespread distribution. Outbreaks in swine are common and cause significant economic losses in industry, primarily by causing stunting and extended time to market. For example, this disease costs the British meat industry about £65 million every year. The 1918 flu pandemic in humans was associated with H1N1 and influenza appearing in pigs; this may reflect a zoonosis either from swine to humans, or from humans to swine. Although it is not certain in which direction the virus was transferred, some evidence suggests, in this case, pigs caught the disease from humans. For instance, swine influenza was only noted as a new disease of pigs in 1918, after the first large outbreaks of influenza amongst people. Although a recent phylogenetic analysis of more recent strains of influenza in humans, birds, animals, and many others and swine suggests the 1918 outbreak in humans followed a reassortment event within a mammal, the exact origin of the 1918 strain remains elusive. It is estimated that anywhere from 50 to 100 million people were killed worldwide. On February 5, 1976, a United States army recruit at Fort Dix said he felt tired and weak. He died the next day, and four of his fellow soldiers were later hospitalized. Two weeks after his death, health officials announced the cause of death was a new strain of swine flu. The strain, a variant of H1N1, is known as A/New Jersey/1976 (H1N1). It was detected only from January 19 to February 9 and did not spread beyond Fort Dix. This new strain appeared to be closely related to the strain involved in the 1918 flu pandemic. Moreover, the ensuing increased surveillance uncovered another strain in circulation in the U.S.: A/Victoria/75 (H3N2), which spread simultaneously, also caused illness, and persisted until March. Alarmed public health officials decided action must be taken to head off another major pandemic, and urged President Gerald Ford that every person in the U.S. be vaccinated for the disease. The vaccination program was plagued by delays and public relations problems. On October 1, 1976, immunizations began, and three senior citizens died soon after receiving their injections. This resulted in a media outcry that linked these deaths to the immunizations, despite the lack of any proof the vaccine was the cause. According to science writer Patrick Di Justo, however, by the time the truth was known—that the deaths were not proven to be related to the vaccine—it was too late. "The government had long feared mass panic about swine flu—now they feared mass panic about the swine flu vaccinations." This became a strong setback to the program. Overall, there were 1098 cases of GBS recorded nationwide by CDC surveillance, 532 of which occurred after vaccination and 543 before vaccination. About one to two cases per 100,000 people of GBS occur every year, whether or not people have been vaccinated. The vaccination program seems to have increased this normal risk of developing GBS by about to one extra case per 100,000 vaccinations. Recompensation charges were filed for over 4,000 cases of severe vaccination damage, including 25 deaths, totalling US$3.5 billion, by 1979. The CDC stated most studies on modern influenza vaccines have seen no link with GBS, Although one review gives an incidence of about one case per million vaccinations, a large study in China, reported in the New England Journal of Medicine, covering close to 100 million doses of H1N1 flu vaccine, found only 11 cases of GBS, which is lower than the normal rate of the disease in China: "The risk-benefit ratio, which is what vaccines and everything in medicine is about, is overwhelmingly in favor of vaccination." In September 1988, a swine flu virus killed one woman and infected others. A 32-year-old woman, Barbara Ann Wieners, was eight months pregnant when she and her husband, Ed, became ill after visiting the hog barn at a county fair in Walworth County, Wisconsin. Barbara died eight days later, after developing pneumonia. The only pathogen identified was an H1N1 strain of swine influenza virus. Doctors were able to induce labor and deliver a healthy daughter before she died. Her husband recovered from his symptoms. Influenza-like illness (ILI) was reportedly widespread among the pigs exhibited at the fair. Of the 25 swine exhibitors aged 9 to 19 at the fair, 19 tested positive for antibodies to SIV, but no serious illnesses were seen. The virus was able to spread between people, since one to three health care personnel who had cared for the pregnant woman developed mild, influenza-like illnesses, and antibody tests suggested they had been infected with swine flu, but there was no community outbreak. In 1998, swine flu was found in pigs in four U.S. states. Within a year, it had spread through pig populations across the United States. Scientists found this virus had originated in pigs as a recombinant form of flu strains from birds and humans. This outbreak confirmed that pigs can serve as a crucible where novel influenza viruses emerge as a result of the reassortment of genes from different strains. Genetic components of these 1998 triple-hybrid stains would later form six out of the eight viral gene segments in the 2009 flu outbreak. On August 20, 2007, Department of Agriculture officers investigated the outbreak of swine flu in Nueva Ecija and central Luzon, Philippines. The mortality rate is less than 10% for swine flu, unless there are complications like hog cholera. On July 27, 2007, the Philippine National Meat Inspection Service (NMIS) raised a hog cholera "red alert" warning over Metro Manila and five regions of Luzon after the disease spread to backyard pig farms in Bulacan and Pampanga, even if these tested negative for the swine flu virus. Since November 2009, 14 deaths as a result of swine flu in Northern Ireland have been reported. The majority of the victims were reported to have pre-existing health conditions which had lowered their immunity. This closely corresponds to the 19 patients who had died in the year prior due to swine flu, where 18 of the 19 were determined to have lowered immune systems. Because of this, many mothers who have just given birth are strongly encouraged to get a flu shot because their immune systems are vulnerable. Also, studies have shown that people between the ages of 15 and 44 have the highest rate of infection. Although most people now recover, having any conditions that lower one's immune system increases the risk of having the flu become potentially lethal. In Northern Ireland now, approximately 56% of all people under 65 who are entitled to the vaccine have gotten the shot, and the outbreak is said to be under control. Swine flu outbreaks were reported in India in late 2014 and early 2015. As of March 19, 2015 the disease has affected 31,151 people and claimed over 1,841 lives. The largest number of reported cases and deaths due to the disease occurred in the western part of India including states like Delhi, Madhya Pradesh, Rajasthan, and Gujarat. Researchers of MIT have claimed that the swine flu has mutated in India to a more virulent version with changes in Hemagglutinin protein. This has however been disputed by Indian researchers. There was another outbreak in India in 2017. The states of Maharashtra and Gujarat were the worst affected. Gujarat high court has given Gujarat government instructions to control deaths by swine flu. Actor Aamir Khan and wife Kiran Rao were among the latest to be afflicted by swine flu. The couple spoke about their battle with the H1N1 virus via video conference at the Satyamev Jayate Water Cup event in Pune, which they had to skip due to ill-health. More than 1094 people died of Swine flu in India in year 2017 till 26 August 2017. Swine flu outbreaks were reported in Nepal in the spring of 2015. As of April 21, 2015 the disease has claimed 26 lives in the most severely affected district, Jajarkot in Northwest Nepal. Cases were also detected in the districts of Kathmandu, Morang, Kaski, and Chitwan. As of 22 April 2015 the Nepal Ministry of Health reported that 2,498 people had been treated in Jajarkot, of whom 552 were believed to have swine flu, and acknowledged that the government's response had been inadequate. The Jajarkot outbreak had just been declared an emergency when the April 2015 Nepal earthquake struck on 25 April 2015, diverting all medical and emergency resources to quake-related rescue and recovery. As of 16 March 2017, over a hundred confirmed cases of swine flu and at least six deaths were reported in the Maldivian capital of Malé and some other islands. Makeshift flu clinics were opened in Male'. Schools, universities and colleges in the capital were closed, prison visitations suspended, several events cancelled, and all non-essential travel to other islands outside the capital was advised against by the HPA. An influenza vaccination program focused on pregnant women was initiated soon after. An official visit by the Saudi King Salman bin Abdulaziz Al Saud to the Maldives during his Asian tour was also cancelled last minute amidst fears over the outbreak of swine flu. A study conducted in 2008, and published in the journal Nature, has managed to establish the evolutionary origin of the flu strain of swine origin (S-OIV). The phylogenetic origin of the flu virus that caused the 2009 pandemics can be traced before 1918. Around 1918, the ancestral virus, of avian origin, crossed the species boundaries and infected humans as human H1N1. The same phenomenon took place soon after in America, where the human virus was infecting pigs; it led to the emergence of the H1N1 swine strain, which later became the classic[clarification needed] swine flu. However, genetic coding of H1N1 shows it is a combination of segments of 4 influenza viruses forming a novel strain– North American Swine (30.6%)- PIG ORIGIN FLU North American Avian (34.4%)– BIRD ORIGIN FLU Human influenza strain (17.5%) Euroasian swine (17.5%)- PIG ORIGIN FLU. QUADRUPLE GENETIC RE-ASSORTMENT - coinfection with influenza viruses from diverse animal species. Due to coinfection, the viruses are able to interact, mutate, and form a new strain to which host has variable immunity. New events of reassortment were not reported until 1968, when the avian strain H1N1 infected humans again; this time the virus met the strain H2N2, and the reassortment originated the strain H3N2. This strain has remained as a stable flu strain until now. The mid-1970s were important for the evolution of flu strains. First, the re-emergence of the human H1N1 strain became a seasonal strain. Then, a small outbreak of swine H1N1 occurred in humans, and finally, the human H2N2 strain apparently became extinct. Around 1979, the avian H1N1 strain infected pigs and gave rise to Euroasiatic swine flu and H1N1 Euroasiatic swine virus, which is still being transmitted in swine populations. The critical moment for the 2009 outbreak was between 1990 and 1993. A triple reassortment event in a pig host of North American H1N1 swine virus, the human H3N2 virus and avian H1N1 virus generated the swine H1N2 strain. Finally, the last step in S-OIV history was in 2009, when the virus H1N2 co-infected a human host at the same time as the Euroasiatic H1N1 swine strain. This led to the emergence of a new human H1N1 strain, which caused the 2009 pandemic. On June 11, 2009, the World Health Organization raised the worldwide pandemic alert level to Phase 6 for swine flu, which is the highest alert level. This alert level means that the swine flu had spread worldwide and there were cases of people with the virus in most countries. The pandemic level identifies the spread of the disease or virus and not necessarily the severity of the disease. Swine flu spread very rapidly worldwide due to its high human-to-human transmission rate and due to the frequency of air travel. In 2015 the instances of swine flu substantially increased to five year highs with over 10,000 cases reported and 660 deaths in India. The states reporting the highest number of cases and deaths are Rajasthan, Gujarat, Madhya Pradesh, Maharashtra, Delhi, and Telangana. The circulating strain of influenza being the same, unmutant strain that caused global pandemic in 2009 (A H1N1 pdm 09), the sudden spurt of the cases in the beginning of 2015 left the Indian government unexplained but concerned. Government instructed the affected states to investigate into the epidemiological reasons of such spurt in the states, and had detailed the advisory guidelines to all states. The guidelines are mainly for (a) description of A H1N1 for prompt identification, detection, and distinction from the symptoms of other similar infection such as common flu(cold) (b) categorization of screening of influenza A H1N1 cases, (c) clinical management protocol of Pandemic influenza A H1N1, (d) providing home care, (e) collection of human sample. Besides, through the National Centre for Diseases Control (NCDC), Directorate General of Health Services (DGHS), Government of India (GoI) had placed a tender to procure 8 kits of Assay sets, 37 kits of one step RT-PCR kit, and 36 kits of viral RNA extraction kits. ^ International Committee on Taxonomy of Viruses. "The Universal Virus Database, version 4: Influenza A". Archived from the original on January 13, 2010. ^ a b c d e f g Swine influenza. The Merck Veterinary Manual. 2008. ISBN 978-1-4421-6742-1. Archived from the original on March 4, 2016. Retrieved April 30, 2009. ^ a b Gibbs, Adrian J.; Armstrong, John S.; Downie, Jean C. (2009-01-01). "From where did the 2009 'swine-origin' influenza A virus (H1N1) emerge?". Virology Journal. 6: 207. doi:10.1186/1743-422X-6-207. ISSN 1743-422X. PMC 2787513. PMID 19930669. ^ "Swine Flu - National Health Portal of India". ^ a b PTI (March 19, 2015). "Swine flu toll inches towards 1,900". The Hindu. Archived from the original on March 20, 2015. Retrieved March 20, 2015. ^ a b c d e f g Kothalawala H, Toussaint MJ, Gruys E (June 2006). "An overview of swine influenza". Vet Q. 28 (2): 46–53. doi:10.1080/01652176.2006.9695207. PMID 16841566. ^ "Key Facts about Swine Influenza (Swine Flu)". Centers for Disease Control and Prevention. Retrieved April 27, 2009. ^ a b c d Myers KP, Olsen CW, Gray GC (April 2007). "Cases of Swine Influenza in Humans: A Review of the Literature". Clinical Infectious Diseases. 44 (8): 1084–8. doi:10.1086/512813. PMC 1973337. PMID 17366454. ^ "Symptoms of H1N1 (Swine Flu)". YouTube. 2009-04-28. Retrieved 2011-05-22. ^ a b Centers for Disease Control and Prevention (April 27, 2009). "CDC Health Update: Swine Influenza A (H1N1) Update: New Interim Recommendations and Guidance for Health Directors about Strategic National Stockpile Materiel". Health Alert Network. Retrieved April 27, 2009. ^ "Study: Swine flu resembles feared 1918 flu". MSNBC. 2009-07-13. Retrieved 2011-05-22. ^ "Swine flu can damage kidneys, doctors find". Reuters. April 14, 2010. Retrieved April 17, 2010. ^ a b c d e "Influenza Factsheet" (PDF). Center for Food Security and Public Health, Iowa State University. ^ Gilchrist MJ, Greko C, Wallinga DB, Beran GW, Riley DG, Thorne PS (February 2007). "The Potential Role of Concentrated Animal Feeding Operations in Infectious Disease Epidemics and Antibiotic Resistance". Environmental Health Perspectives. 115 (2): 313–6. doi:10.1289/ehp.8837. PMC 1817683. PMID 17384785. ^ Saenz RA, Hethcote HW, Gray GC (2006). "Confined Animal Feeding Operations as Amplifiers of Influenza". Vector-Borne and Zoonotic Diseases. 6 (4): 338–46. doi:10.1089/vbz.2006.6.338. PMC 2042988. PMID 17187567. ^ Vicente J, León-Vizcaíno L, Gortázar C, José Cubero M, González M, Martín-Atance P (July 2002). "Antibodies to selected viral and bacterial pathogens in European wild boars from southcentral Spain". Journal of Wildlife Diseases. 38 (3): 649–52. doi:10.7589/0090-3558-38.3.649. PMID 12238391. ^ a b Gray GC, Kayali G (April 2009). "Facing pandemic influenza threats: the importance of including poultry and swine workers in preparedness plans". Poultry Science. 88 (4): 880–4. doi:10.3382/ps.2008-00335. PMID 19276439. ^ Gray GC, Trampel DW, Roth JA (May 2007). "Pandemic Influenza Planning: Shouldn't Swine and Poultry Workers Be Included?". Vaccine. 25 (22): 4376–81. doi:10.1016/j.vaccine.2007.03.036. PMC 1939697. PMID 17459539. ^ Gray GC, McCarthy T, Capuano AW, Setterquist SF, Olsen CW, Alavanja MC (December 2007). "Swine Workers and Swine Influenza Virus Infections". Emerging Infectious Diseases. 13 (12): 1871–8. doi:10.3201/eid1312.061323. PMC 2876739. PMID 18258038. ^ Myers KP, Olsen CW, Setterquist SF, et al. (January 2006). "Are Swine Workers in the United States at Increased Risk of Infection with Zoonotic Influenza Virus?". Clinical Infectious Diseases. 42 (1): 14–20. doi:10.1086/498977. PMC 1673212. PMID 16323086. ^ a b Thacker E, Janke B (February 2008). "Swine influenza virus: zoonotic potential and vaccination strategies for the control of avian and swine influenzas". J. Infect. Dis. 197 Suppl 1: S19–24. doi:10.1086/524988. PMID 18269323. ^ Yu H, Hua RH, Zhang Q, et al. (March 2008). "Genetic Evolution of Swine Influenza A (H3N2) Viruses in China from 1970 to 2006". Journal of Clinical Microbiology. 46 (3): 1067–75. doi:10.1128/JCM.01257-07. PMC 2268354. PMID 18199784. ^ Lindstrom SE, Cox NJ, Klimov A (October 2004). "Genetic analysis of human H2N2 and early H3N2 influenza viruses, 1957–1972: evidence for genetic divergence and multiple reassortment events". Virology. 328 (1): 101–19. doi:10.1016/j.virol.2004.06.009. PMID 15380362. ^ World Health Organization (28 October 2005). "H5N1 avian influenza: timeline" (PDF). Archived from the original (PDF) on July 27, 2011. ^ "Indonesian pigs have avian flu virus; bird cases double in China". University of Minnesota: Center for Infectious Disease Research and Policy. 27 May 2005. Retrieved 2009-04-26. ^ Roos Robert, ed. (31 March 2009). "H5N1 virus may be adapting to pigs in Indonesia". University of Minnesota: Center for Infectious Disease Research & Policy. Retrieved 2009-04-26. report on pigs as carriers. ^ Heinen PP (15 September 2003). "Swine influenza: a zoonosis". Veterinary Sciences Tomorrow. ISSN 1569-0830. Archived from the original on 6 May 2009. Influenza B and C viruses are almost exclusively isolated from man, although influenza C virus has also been isolated from pigs and influenza B has recently been isolated from seals. ^ Bouvier NM, Palese P (September 2008). "THE BIOLOGY OF INFLUENZA VIRUSES". Vaccine. 26 Suppl 4 (Suppl 4): D49–53. doi:10.1016/j.vaccine.2008.07.039. PMC 3074182. PMID 19230160. ^ Kimura H, Abiko C, Peng G, et al. (April 1997). "Interspecies transmission of influenza C virus between humans and pigs". Virus Research. 48 (1): 71–9. doi:10.1016/S0168-1702(96)01427-X. PMID 9140195. ^ a b Matsuzaki Y, Sugawara K, Mizuta K, et al. (February 2002). "Antigenic and Genetic Characterization of Influenza C Viruses Which Caused Two Outbreaks in Yamagata City, Japan, in 1996 and 1998". Journal of Clinical Microbiology. 40 (2): 422–9. doi:10.1128/JCM.40.2.422-429.2002. PMC 153379. PMID 11825952. ^ Lynch JP, Walsh EE (April 2007). "Influenza: evolving strategies in treatment and prevention". Semin Respir Crit Care Med. 28 (2): 144–58. doi:10.1055/s-2007-976487. PMID 17458769. ^ Ma W, Vincent AL, Gramer MR, et al. (December 2007). "Identification of H2N3 influenza A viruses from swine in the United States". Proceedings of the National Academy of Sciences of the United States of America. 104 (52): 20949–54. Bibcode:2007PNAS..10420949M. doi:10.1073/pnas.0710286104. PMC 2409247. PMID 18093945. ^ Shin JY, Song MS, Lee EH, et al. (November 2006). "Isolation and Characterization of Novel H3N1 Swine Influenza Viruses from Pigs with Respiratory Diseases in Korea". Journal of Clinical Microbiology. 44 (11): 3923–7. doi:10.1128/JCM.00904-06. PMC 1698339. PMID 16928961. ^ Yassine HM, Al-Natour MQ, Lee CW, Saif YM (2007). "Interspecies and intraspecies transmission of triple reassortant H3N2 influenza A viruses". Virology Journal. 4: 129. doi:10.1186/1743-422X-4-129. PMC 2228287. PMID 18045494. ^ "CDC confirms 145 cases of swine flu". FoxNews.com. 9 August 2012. Retrieved 9 August 2012. ^ MYERS, AMANDA LEE. "1ST DEATH LINKED TO NEW SWINE FLU IS OHIOAN, 61". AP. Retrieved 1 September 2012. ^ "CDC H1N1 Flu | Interim Guidance on Specimen Collection, Processing, and Testing for Patients with Suspected Novel Influenza A (H1N1) (Swine Flu) Virus Infection". Cdc.gov. 2009-05-13. Retrieved 2011-05-22. ^ "RNASound(TM) RNA Sampling Cards (25)". fortiusbio.com. Retrieved 9 January 2016. ^ "Micronics Acquires License to Biosearch Technologies' Nucleic Acid Assay Chemistries". Biosearchtech.com. 2009-10-28. Retrieved 2011-05-22. ^ "Swine flu virus turns endemic". National Hog Farmer. 15 September 2007. ^ "Swine". Custom Vaccines. Novartis. Archived from the original on April 30, 2009. ^ Gramer MR, Lee JH, Choi YK, Goyal SM, Joo HS (July 2007). "Serologic and genetic characterization of North American H3N2 swine influenza A viruses". Canadian Journal of Veterinary Research. 71 (3): 201–6. PMC 1899866. PMID 17695595. ^ "Swine flu: The predictable pandemic?". 2009-04-29. ^ Ramirez A, Capuano AW, Wellman DA, Lesher KA, Setterquist SF, Gray GC (June 2006). "Preventing Zoonotic Influenza Virus Infection". Emerging Infect. Dis. 12 (6): 996–1000. doi:10.3201/eid1206.051576. PMC 1673213. PMID 16707061. ^ a b "Q & A: Key facts about swine influenza (swine flu) – Spread of Swine Flu". Centers for Disease Control and Prevention. 24 April 2009. Retrieved 2009-04-26. ^ a b "CDC H1N1 Flu | H1N1 Flu and You". Cdc.gov. Retrieved 2011-05-22. ^ "Q & A: Key facts about swine influenza (swine flu) – Diagnosis". Centers for Disease Control and Prevention. 24 April 2009. Retrieved 2009-04-26. ^ "CDC – Influenza (Flu) | Swine Influenza (Flu) Investigation". Cdc.gov. Retrieved 2009-04-27. ^ "Chlorine Bleach: Helping to Manage the Flu Risk". Water Quality & Health Council. April 2009. Retrieved 2009-05-12. ^ "Self protection measures". LHC. Archived from the original on 2009-10-31. Retrieved 2009-10-15. ^ "FDA Approves Vaccines for 2009 H1N1 Influenza Virus". FDA. Retrieved 2009-10-15. ^ "NIH studies on Swine flu vaccine". NIH. Archived from the original on October 13, 2009. Retrieved 2009-10-15. ^ Uscher-Pines, Lori, Jurgen Maurer, and Katherine M. Harris. "Racial And Ethnic Disparities In Uptake And Location Of Vaccination For 2009-H1N1 And Seasonal Influenza." American Journal of Public Health 101.7 (2011) 1252–1255. SocINDEX with Full Text. Web. 6 Dec. 2011. ^ Ginsberg M, Hopkins J; et al. (22 April 2009). "Swine influenza A (H1N1) infection in two children --- Southern California, March—April 2009". Morbidity and Mortality Weekly Report. 58 (Dispatch) (1–3). ^ Laura H. Kahn (2007-03-13). "Animals: The world's best (and cheapest) biosensors". Retrieved 15 August 2014. ^ "WHO | Pandemic (H1N1) 2009: Frequently asked questions". ^ "Antiviral Drugs and Swine Influenza". Centers for Disease Control. Retrieved 2009-04-27. ^ "FDA Authorizes Emergency Use of Influenza Medicines, Diagnostic Test in Response to Swine Flu Outbreak in Humans. FDA News, April 27, 2009". Fda.gov. 2009-04-27. Retrieved 2009-05-07. ^ a b c Knobler S, Mack A, Mahmoud A, Lemon S (eds.). "1: The Story of Influenza". The Threat of Pandemic Influenza: Are We Ready? Workshop Summary (2005). Washington, D.C.: The National Academies Press. p. 75. ^ a b Olsen CW (May 2002). "The emergence of novel swine influenza viruses in North America". Virus Research. 85 (2): 199–210. doi:10.1016/S0168-1702(02)00027-8. PMID 12034486. ^ Boffey, Philip M. (5 September 1976). "Soft evidence and hard sell". New York Times. ^ a b c d Taubenberger JK, Morens DM (2006). "1918 Influenza: the mother of all pandemics". Emerg Infect Dis. 12 (1): 15–22. doi:10.3201/eid1201.050979. PMC 3291398. PMID 16494711. ^ "U.S. pork groups urge hog farmers to reduce flu risk". Reuters. 26 April 2009. ^ Heinen, P. (2003). "Swine influenza: a zoonosis". Veterinary Sciences Tomorrow: 1–11. Archived from the original on 2009-05-06. Retrieved 2009-05-04. ^ Kay RM, Done SH, Paton DJ (August 1994). "Effect of sequential porcine reproductive and respiratory syndrome and swine influenza on the growth and performance of finishing pigs". Vet. Rec. 135 (9): 199–204. doi:10.1136/vr.135.9.199. PMID 7998380. ^ Vana G, Westover KM (June 2008). "Origin of the 1918 Spanish influenza virus: a comparative genomic analysis". Molecular Phylogenetics and Evolution. 47 (3): 1100–10. doi:10.1016/j.ympev.2008.02.003. PMID 18353690. ^ Antonovics J, Hood ME, Baker CH (April 2006). "Molecular virology: was the 1918 flu avian in origin?". Nature. 440 (7088): E9, discussion E9–10. Bibcode:2006Natur.440E...9A. doi:10.1038/nature04824. PMID 16641950. ^ Patterson KD, Pyle GF (1991). "The geography and mortality of the 1918 influenza pandemic". Bulletin of the History of Medicine. 65 (1): 4–21. PMID 2021692. ^ a b Gaydos JC, Top FH, Hodder RA, Russell PK (January 2006). "Swine influenza a outbreak, Fort Dix, New Jersey, 1976". Emerging Infectious Diseases. 12 (1): 23–8. doi:10.3201/eid1201.050965. PMC 3291397. PMID 16494712. ^ Schmeck, Harold M. (March 25, 1976). "Ford Urges Flu Campaign To Inoculate Entire U.S." The New York Times. Archived from the original on 2013-05-21. Retrieved 2017-02-13. ^ Richard E. Neustadt and Harvey V. Fineberg. (1978). The Swine Flu Affair: Decision-Making on a Slippery Disease. National Academies Press. ^ "The Last Great Swine Flu Epidemic", Salon.com, April 28, 2009. ^ Retailliau HF, Curtis AC, Storr G, Caesar G, Eddins DL, Hattwick MA (March 1980). "Illness after influenza vaccination reported through a nationwide surveillance system, 1976–1977". American Journal of Epidemiology. 111 (3): 270–8. doi:10.1093/oxfordjournals.aje.a112896. PMID 7361749. ^ "Historical National Population Estimates: July 1, 1900 to July 1, 1999". Washington D.C.: Population Division, U.S. Bureau of the Census. 2000-06-28. Retrieved 2009-08-21. ^ Schonberger LB, Bregman DJ, Sullivan-Bolyai JZ, et al. (August 1979). "Guillain–Barre syndrome following vaccination in the National Influenza Immunization Program, United States, 1976–1977". American Journal of Epidemiology. 110 (2): 105–23. doi:10.1093/oxfordjournals.aje.a112795. PMID 463869. ^ a b c "General Questions and Answers on Guillain–Barré syndrome". Centers for Disease Control and Prevention. September 14, 2009. ^ "Swine Flu 1976 | Swine flu 'debacle' of 1976 is recalled – Los Angeles Times". Articles.latimes.com. 2009-04-27. Retrieved 2011-08-17. ^ Haber P, Sejvar J, Mikaeloff Y, DeStefano F (2009). "Vaccines and Guillain–Barré syndrome". Drug Safety. 32 (4): 309–23. doi:10.2165/00002018-200932040-00005. PMID 19388722. ^ Kaplan JE, Katona P, Hurwitz ES, Schonberger LB (August 1982). "Guillain–Barré syndrome in the United States, 1979–1980 and 1980–1981. Lack of an association with influenza vaccination". JAMA. 248 (6): 698–700. doi:10.1001/jama.248.6.698. PMID 7097920. ^ Vellozzi C, Burwen DR, Dobardzic A, Ball R, Walton K, Haber P (March 2009). "Safety of trivalent inactivated influenza vaccines in adults: Background for pandemic influenza vaccine safety monitoring". Vaccine. 27 (15): 2114–2120. doi:10.1016/j.vaccine.2009.01.125. PMID 19356614. ^ "Last Year's (2009) H1N1 Flu Vaccine Was Safe, Study Finds". Wunderground.com. 2011-02-02. Retrieved 2011-05-22. ^ McKinney WP, Volkert P, Kaufman J (January 1990). "Fatal swine influenza pneumonia during late pregnancy". Archives of Internal Medicine. 150 (1): 213–5. doi:10.1001/archinte.150.1.213. PMID 2153372. ^ Kimura K, Adlakha A, Simon PM (March 1998). "Fatal case of swine influenza virus in an immunocompetent host". Mayo Clinic Proceedings. 73 (3): 243–5. doi:10.4065/73.3.243. PMID 9511782. ^ "Key Facts About Swine Flu (CDC)". Cdc.gov. Retrieved 2009-05-07. ^ Wells DL, Hopfensperger DJ, Arden NH, et al. (1991). "Swine influenza virus infections. Transmission from ill pigs to humans at a Wisconsin agricultural fair and subsequent probable person-to-person transmission". JAMA. 265 (4): 478–81. doi:10.1001/jama.265.4.478. PMID 1845913. ^ "DA probes reported swine flu 'outbreak' in N. Ecija". Gmanews.tv. Retrieved 2009-04-25. ^ "Gov't declares hog cholera alert in Luzon". Gmanews.tv. Retrieved 2009-04-25. ^ "New mothers urged to get swine flu vaccine". BBC News. 2011-01-10. Retrieved 2011-01-20. ^ "Swine Flu Claims Over 1,700 Lives". NDTV.com. 15 March 2015. Retrieved 9 January 2016. ^ "Flu Roko: Has Indian swine flu changed to be more dangerous?". fluroko.com. Archived from the original on 10 January 2016. Retrieved 9 January 2016. ^ "Maharashtra and Gujarat See Highest Number of Swine Flu Deaths". News18. Retrieved 2017-08-17. ^ "Control swine flu deaths: Gujarat high court to government - Times of India". The Times of India. Retrieved 2017-08-17. ^ "Aamir Khan and Kiran Rao down with Swine Flu". ^ "Swine flu kills over 1,000 Indians in 2017, worst outbreak since 2009-10". Moneycontrol. Retrieved 2017-08-26. ^ "One more dies of swine flu in Jajarkot". nepalaawaj.com. 21 April 2015. Archived from the original on 2016-01-30. Retrieved 8 February 2016. ^ "Lab Test on three samples from Jajarkot confirms swine flu". infonepal.com. 15 April 2015. Archived from the original on 12 February 2016. Retrieved 8 February 2016. ^ "Swine flu outbreak kills 24 in Nepal". aa.com.tr. 22 April 2015. Retrieved 8 February 2016. ^ "Swine flu spreads across Punjab, 3 more patients identified in Multan - Pakistan - Dunya News". dunyanews.tv. Retrieved 9 January 2016. ^ "Makeshift flu clinics swamped as H1N1 cases rise to 82 - Maldives - Maldives Independent". maldivesindependent.com. Retrieved 16 March 2017. ^ "Woman dies in second H1N1 fatality as cases rise above 100 - Maldives - Maldives Independent". maldivesindependent.com. Retrieved 16 March 2017. ^ Rambaut, Andrew; Guan, Yi; Peiris, J. S. Malik; Bhatt, Samir; Raghwani, Jayna; Cheung, Chung Lam; Ma, Siu Kit; Pybus, Oliver G.; Worobey, Michael; Lycett, Samantha J.; Bahl, Justin; Vijaykrishna, Dhanasekaran; Smith, Gavin J. D. (June 2009). "Origins and evolutionary genomics of the 2009 swine-origin H1N1 influenza A epidemic : Article". Nature. 459 (7250): 1122–1125. doi:10.1038/nature08182. PMID 19516283. ^ a b Choffnes, Eileen R., Alison Mack, and David A. Relman. The Domestic and International Impacts of the 2009-H1N1 Influenza a Pandemic: Global Challenges, Global Solutions : Workshop Summary. Washington, D.C.: National Academies, 2010. Print. ^ "Swine flu deaths soar past 660". the hindu. 2015-02-18. Retrieved 2015-02-18. ^ "2015 swine flu toll at 485, more than two-fold jump over 2014". Economic Times. New Delhi. 2015-02-13. Retrieved 2015-02-17. Alexander DJ (October 1982). "Ecological aspects of influenza A viruses in animals and their relationship to human influenza: a review". Journal of the Royal Society of Medicine. 75 (10): 799–811. PMC 1438138. PMID 6752410. Hampson AW, Mackenzie JS (November 2006). "The influenza viruses". The Medical Journal of Australia. 185 (10 Suppl): S39–43. PMID 17115950. Lipatov AS, Govorkova EA, Webby RJ, et al. (September 2004). "Influenza: Emergence and Control". Journal of Virology. 78 (17): 8951–9. doi:10.1128/JVI.78.17.8951-8959.2004. PMC 506949. PMID 15308692. Van Reeth K (2007). "Avian and swine influenza viruses: our current understanding of the zoonotic risk". Veterinary Research. 38 (2): 243–60. doi:10.1051/vetres:2006062. PMID 17257572. Winkler WG (October 1970). "Influenza in animals: its possible public health significance". Journal of Wildlife Diseases. 6 (4): 239–42, discussion 247–8. doi:10.7589/0090-3558-6.4.239. PMID 16512120. Wikimedia Commons has media related to Swine flu.